When pampered Jacqueline Abington secretly elopes with the family gardener, she asks another woman to take her place on the much anticipated maiden voyage of the Titanic. Tessa Yarborough hails from a poor corner of London but has been granted the opportunity of a lifetime--a ticket to sail to America aboard a famed vessel. But there's a catch: she must assume Jacqueline's identity. For the first time in her life, Tessa stays in luxurious quarters, dresses in elegant gowns, and dines with prestigious people. Then a wealthy American man takes an interest in her, and Tessa struggles to keep up the ruse as she begins falling for him. When tragedy strikes, the game is up, and two women's lives are forever changed. 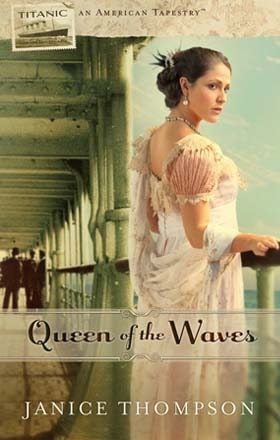 Queen of the Waves is an interesting narrative look at the lives of some who survived the Titanic disaster. The author has created fictional characters to weave among real life historical figures and created a new story to tell against the backdrop of this tragedy. There are three narrators to this story- Jaqueline Abington is in love with her family's gardener and deceives her family into thinking she has gotten on the Titanic to escape an arranged marriage. Her sections in this novel are brief and only give a hint into the couple's relationship and history. The second narrator introduced into this story was Tessa. Tessa is the younger sister of Jaqueline's gardener and takes her place on the Titanic to escape and abusive father. She assumes Jaqueline's identity- which is not always easy for a young girl who did not grow up in society. The third narrator in this story was Iris, Jaqueline's personal maid. Iris wants nothing to do with either girl and is using both for a free escape to America to begin her life again. I love stories about the Titanic- I find them to be incredibly interesting! The author did a great job of weaving history into the storyline. It never felt forced or fake, and the relationships of the characters were not overshadowed by the "what was coming". I enjoyed this story and I know that fans of historical Christian novels will enjoy it also! This was an exciting story! Poor Samantha has had a rough life- losing her mother, then father, and is traveling across the country on the Oregon Trail. First of all, I want to note that the summary above is a little confusing- although all of these things DID happen, the summary has them out of order and really does tell you the entire story. I enjoyed the relationship between Samantha and Alex. Although it was a little insta-love for me, looking over that fact it was a good romance and I enjoyed looking at a part of history I typically do not read about. I enjoyed the nature scenes, especially at the beginning of the book when Samantha was still traveling on the trail. 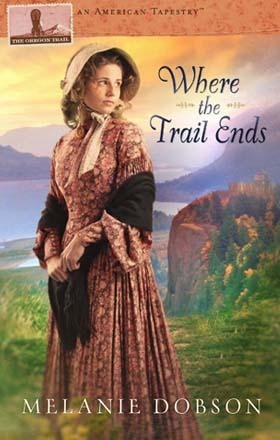 Where the Trail Ends has an interesting storyline and fascinating characters. I look forward to reading more from this author! Both historical novels have very interesting premises. Even though you know what happens with the Titanic, it's always exciting to read about the "happenings" among the travelers before the tragedy strikes.